Need help engaging with investors, raising capital or building profile? Subscribe to the fortnightly newsletter Media Motivators to get ideas, tips and practical solutions to media, marketing and management issues. 8M provides solutions to media and communication issues, including crisis communications at an individual and corporate level. We also help engage with investors, raise capital or build a profile. As an entrepreneur, start-up, professional service provider or small business owner do you want a cost effective solution to business growth through the power of collaboration, peer-problem sharing and group mentoring? Thomas A.C. Murrell MBA CSP is an author, international business speaker and global thought leader on capital investment marketing. He is also an engaging, experienced and authoritative speaker who brings to the stage his company director corporate experience, powerful personal stories as an elite level athlete and professionalism honed working behind a microphone for more than 35 years. Are you an aspiring or experienced leader who wants to be more influential and visible to drive transformational change, business growth or social good? Then our open public seminar series are for you. Need a keynote speaker, MC or facilitator? Thomas Murrell MBA CSP is an expert on how media disruption and fragmentation are driving change across the international business landscape and how you can take advantage of this. Power up your marketing efforts with this free eBook! 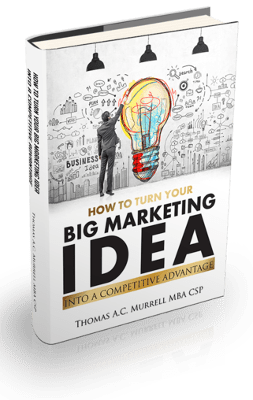 Instant ideas, insights and strategies on how to grow your business and turn your big marketing idea into a competitive advantage forever. Welcome to the Ideas Age! It’s time for you to take action on your Big marketing idea! This is the ideal resource to turn your idea into a viable and profitable business. Download now for free!